Despite notifying the officials concerned and the local politicians about the problem, the roads continue to be neglected. People place photos of minister K.T. Rama Rao and Kukatpally MLA Madhavaram Krishna on top of potholes at KPHB. Hyderabad: The number of potholes in Kukatpally constituency is only increasing, and the advent of rains had made things worse at KPHB Colony and Balajinagar, where drainage water joins the mess. Fed up with this, Congress leaders on Wednesday planted placards signs carrying pictures of minister K.T. 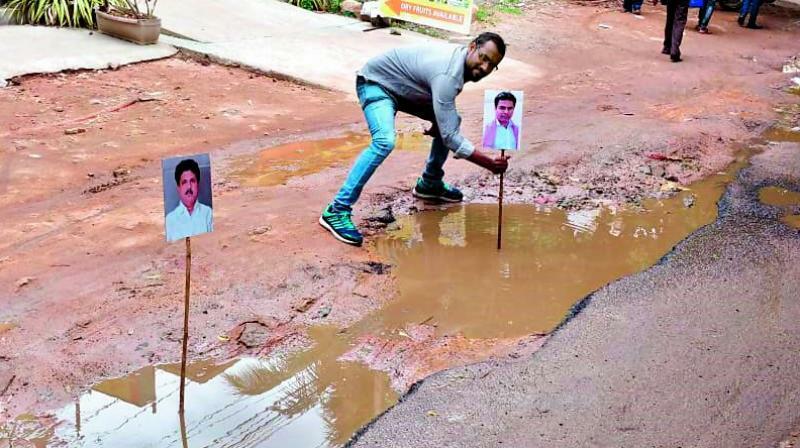 Rama Rao and Kukatpally MLA Madhavaram Krishna Rao on potholes. “People are facing inconvenience due to the stench, mosquito menace and have met with accidents,” alleged Kukatpally Congress leader S. Satish Reddy. The biggest problem face by citizens of western Hyderabad is traffic and pollution, and it is important for them to use public transportation and act in ways that protects the environment, minister K.T. Rama Rao said on Wednesday. Forest minister Jogu Ramanna and Mr Rama Rao inaugurated the renovated Botanical Garden at Kothaguda with new facilities such as environmental education centre, outdoor and indoor gym, yoga and meditation centre, a mini golf course and a 30-KW solar power plant. “There is a fear among people that if they go to the western part of the city, they are not sure how long they will be stuck in traffic. Despite building flyovers and the Metro Rail, unless people the cooperate, government will not be able to do big things,” Mr Rama Rao said. “We may be the number 1 city in the country for living standards but we are ranked 141 across the cities of world as per the Mercer rating. This is because of urbanization and creation of a concrete jungle,” he said.